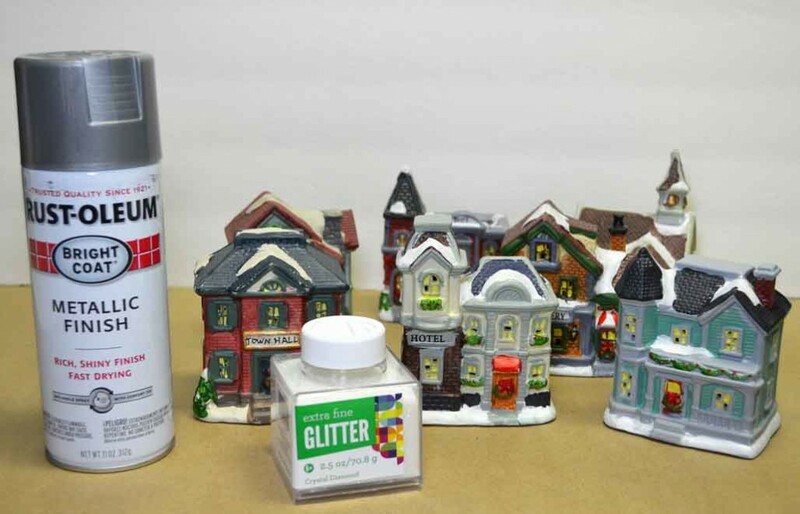 I was excited to paint and glitter this Christmas village this year for a few reasons. For one, I thought it was the perfect craft for my grandson to help with. ahem. 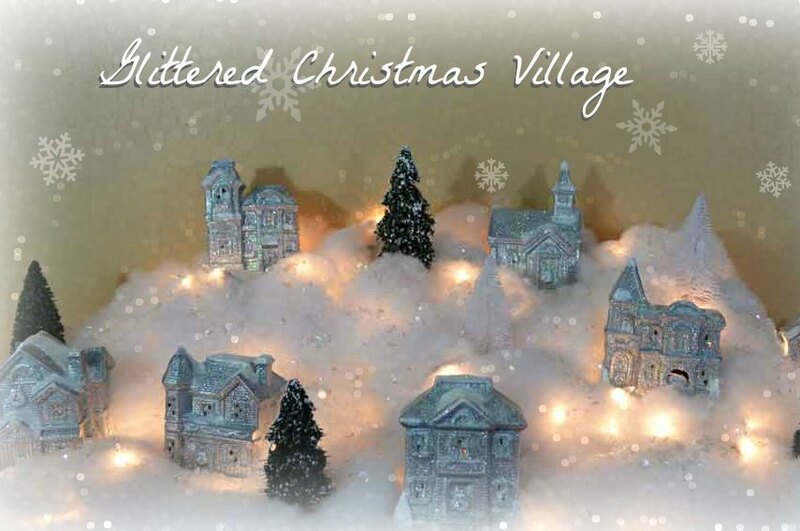 He had other plans but, believe me, when you find out what they are, you’ll understand why I didn’t care that he wasn’t into the glittered village. 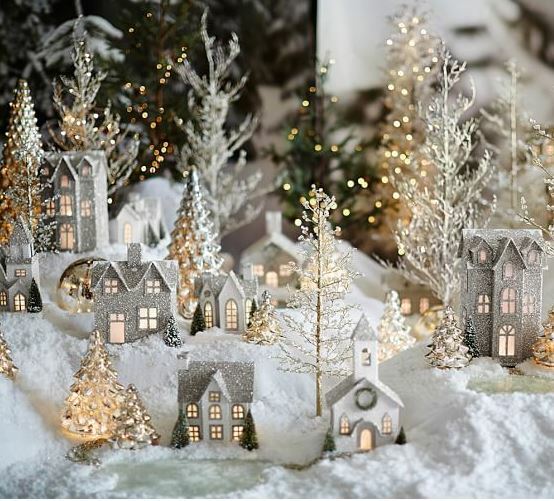 I was first inspired when I saw this beautiful village in Pottery Barn’s catalog. It’s no longer available, btw. But I loved the look. Although they used german glitter, which I’ve never even seen in person. Also, their houses were made from cardboard, and that reminded me of a little village my mother had when I was growing up, made also from cardboard. Luckily I didn’t have to make my own cardboard houses . . . oh yes, I thought about it for a minute or two . . . but the dollar store and Walmart had a fairly decent selection. 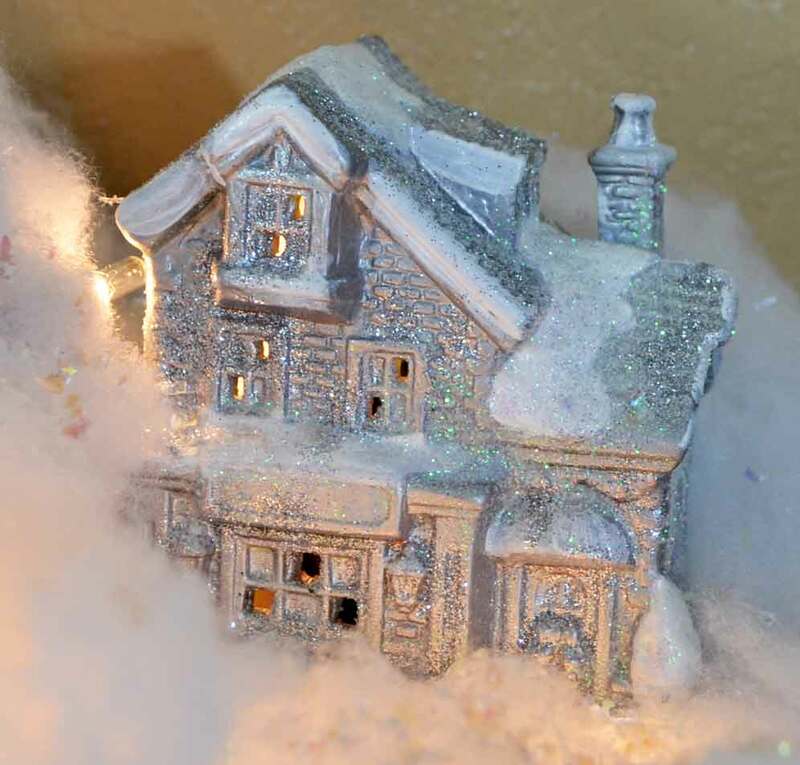 So I picked up some houses, silver spray paint, extra fine white glitter and Mod Podge . . . still thinking Santino would be my Main Glitter Pourer. 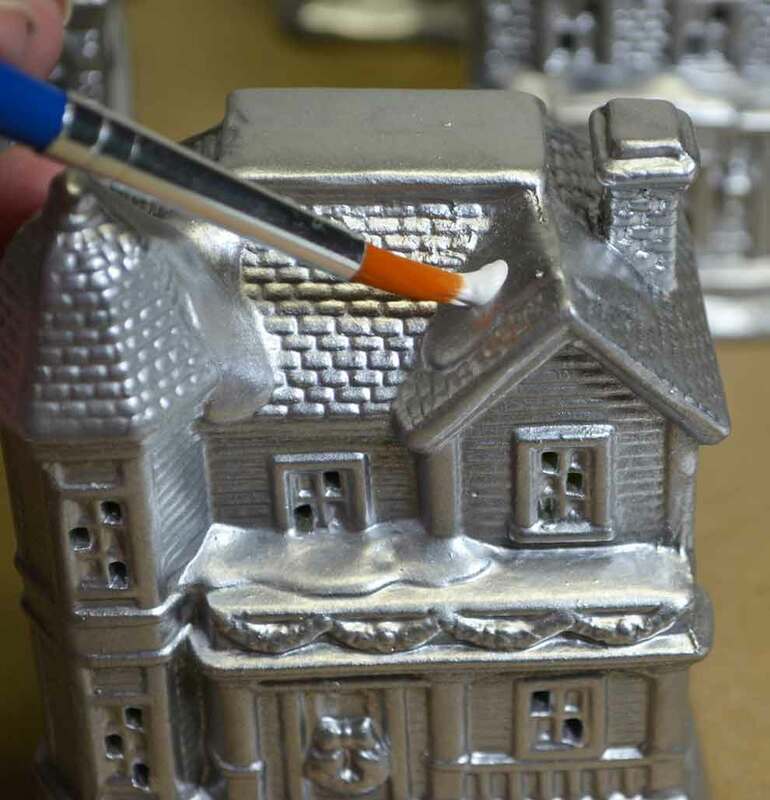 I even thought about outlining the window frames with glue and glittering them a different color. Oh yes, the OCDish tendencies are back. And another ‘announcement’ of sorts, I made a video. Yes, a very detailed demonstration of painting, ‘podging, and pouring glitter on little houses. However, since I am planning on shooting video classes and workshops in 2015, I really need to get back into shooting and editing them. Until I can find someone I can coerce into editing them at least. The shooting part . . . well, that’s gonna take some practice too. I honestly thought everything was in focus. But painting a canvas or piece of watercolor paper is much, much different than moving a tiny house and glitter around or setting it up in one of the darkest parts of my house. 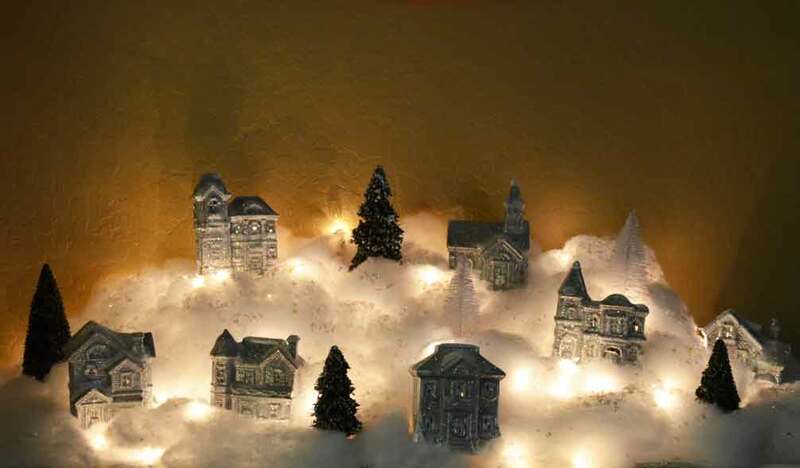 The village actually turned out pretty cute, in spite of the video. Of course, it’s much prettier at night. And you actually can see little lights thru the windows. I’ll definitely look for some of those crystal trees when they go on sale though. If you haven’t watched the video yet, then let me tell you about the final touch – the wreath hanging above the village. 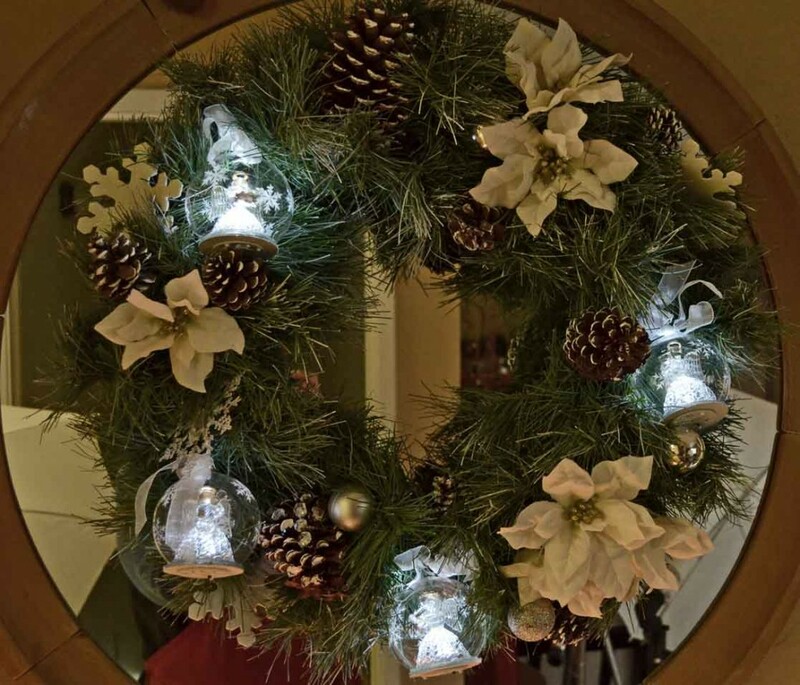 I hung a wreath on that mirror last year too but this year I wanted something different. Because this year, everything is different. 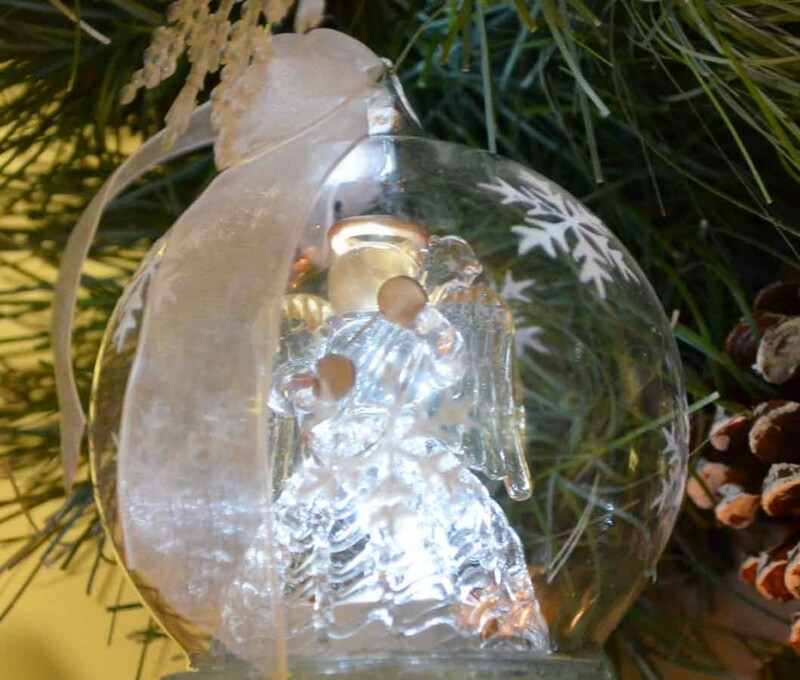 I added the glass angel ornaments to the wreath that Mom ordered last year. We didn’t really know where to display them but she absolutely loved them. Somehow having Mom’s angels hanging above the little village made it seem just . . . perfect. I’m really torn now between working on video classes for early Spring and decorating a little more for Santino. We’ll see what this week brings. How about you? Are you running yourself ragged or are you all done and relaxing? Whichever the case, I hope you’re finding a few moments each day to find something to appreciate about the season. I can tell you something I always appreciate is those of you who drop by here to see what I’m up to. It is always deeply, deeply appreciated. I hope you are doing well! The villiage is beautiful. Hope you have a Merry Christmas! 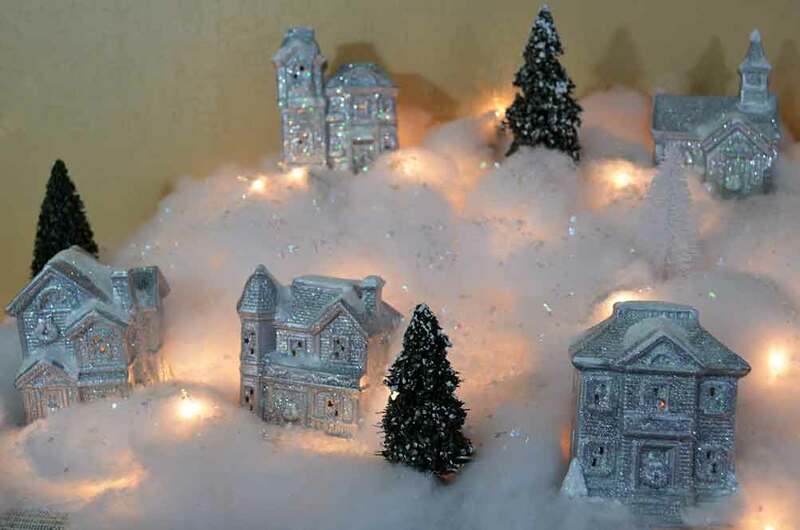 What a sweet little village, Colleen! 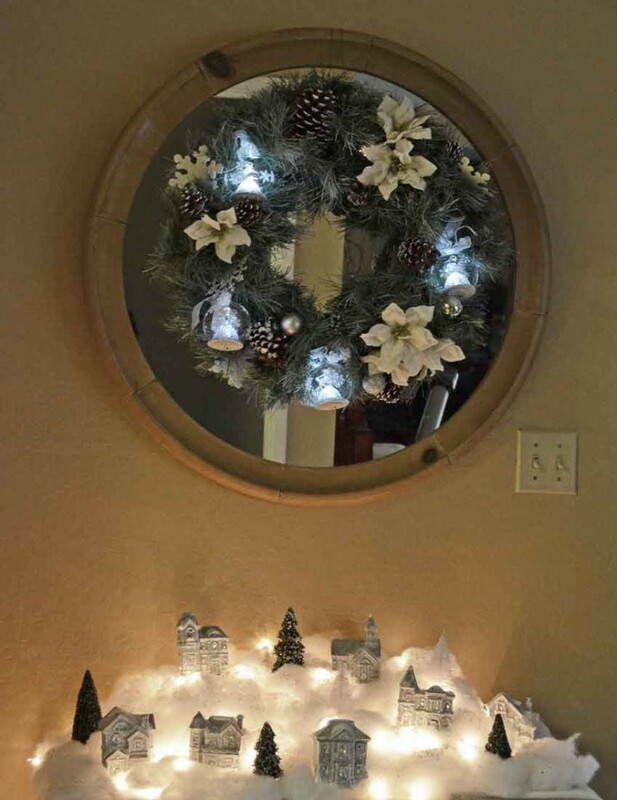 Your Christmas decor is lovely. Take it easy this year and remember all the fun stuff! I’m off to watch your video which I’m sure is fine and very instructive. Merry Christmas! I am so happy to see you posting and sharing ideas. Yes, it will be different this year. You need to find your new “normal”. I will keep you in my thoughts and prayers. May the true meaning of Christmas give peace to your heart.